Those times when you were worrying about not having enough space on your phone for photos and music are gone. Nowadays, cloud storage is getting more and more popular, as people prefer having access to all their files at any time and in any moment. After all, we don’t see why anybody wouldn’t like this, as it’s safe and you don’t have to carry around any memory cards, flash drives or even portable hard disk drives. One of the most popular cloud storage services is DropBox, but if you decide to opt for it too, you should know that after signing up, you will get just 2 GB of space. Not that much, right? 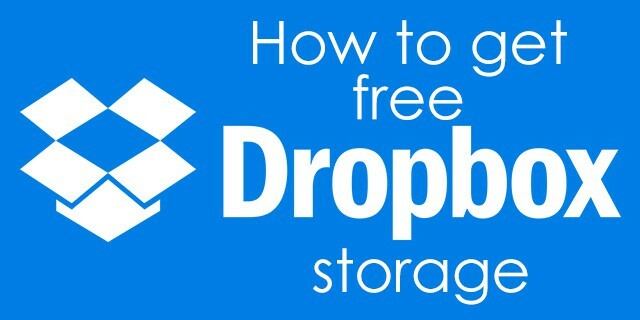 Fortunately, there are a few methods which you can use in order to get free Dropbox storage. And don’t worry, as you don’t have to use some kind of hacks or third-party apps for this. No, not at all. It’s simpler than you can think! Here you can find all the available methods which can use to get free Dropbox storage and have access to a lot of space for music, photos and many more. What if we told you that you can get even more space just by pressing a “Follow” button? That’s right, follow the company on Twitter and you’ll end up with 2,375 GB of storage. Since you’re already on Twitter, why not tell all your followers that you love your new cloud storage service? Instead of ‘thank you’, you will receive an extra 125 MB and make a total of 2.5 GB. These guys really want to know what you think about their service. Send them some feedback and tell them how great Dropbox is. And because they value your opinion so much, you will receive another bonus, having now 2.625 GB. Another easy way to get free Dropbox storage is to sync it to your Facebook profile. And don’t worry, as you can revoke the access from your account right away and still have the space. 2.75 GB, simple as that. Things are getting serious if you’re willing to install this app which enables auto upload for your photos. It’s available for both iOS and Android and it takes your storage count to 5.75 GB. If you’re an iOS user, you can sync your account with Dropbox and get another GB of space. You can even delete after this is done and your space is still yours. 6.75 GB aren’t that bad, right? A great way to get free Dropbox storage is to have a Samsung or HTC phone. If your Sammy is manufactured after Q3 of 2014 and it comes with the Dropbox pre-installed, you are eligible for a whooping 48 GB of space, available for two years. Over 50 gigs of space are just great, we’d say! As for HTC owners, new devices running the Sense 4.0 and above or Sense 5.0 are eligible for 23 GB of storage, available of two years. This would make a total of 28,75 GB of free Dropbox storage which any HTC user can benefit from. Basically, the most important method of getting free storage is the referral system. For every friend you refer (signing up for Dropbox is mandatory) you can get a 500 MB bonus. You can do it 32 times and, of course, you can always make fake accounts in order to get free Dropbox storage, but it’s not that ethic. On the other side…it’s free storage! Using this method, you can get over 40 or 60 GB of space, depending on the device you’re using. As you can see, Dropbox can be your best friend when it comes to cloud storage. You don’t need to pay for anything and enjoy its advantages. With so many free gigabytes available, you don’t even need a microSD card. On the other side, if you like to keep all your music collection on your phone and access it even when you don’t have an Internet connection, a card can be good, but that’s another story. We hope that you will find useful our tips on how to get free Dropbox storage and exploit this great service to the max. As always, if you have discovered any other methods of doing this, feel free to share them with us, using the comments section below. Keep an eye on our blog, as we will be back with more similar guides, presenting all the ways of getting free storage from similar services, like Google Drive, Microsoft OneDrive, Box, BitTorrent Sync or Amazon Cloud Storage.